Probashbangla24 online Desk : The five-day Durga Puja, the biggest religious festival of the Bangalee Hindu community, entered the second day as Maha Saptami is being celebrated with much enthusiasm and religious fervor at temples across the country. Saptami is the seventh day of Devi Pakhsha that begins from Mahalaya on October 8 last heralding the advent of goddess Durga. Maha Saptami Puja was held in the morning at temples across the country while other rituals of the day will be held across the day. Recitation of verses from the Holy Chandi, blowing of conch shells and beating of dhak-dhols at temples and pandals are being continued from Maha Shashti (Monday) which will continue till immersion of idols of goddess Durga on October 19. The five-day festival began on Monday with the incarnation (Bodhon) of the Goddess Durga on the day of Maha Shashti. Maha Ashtami, Kumari Puja and Sandhi Puja will be performed on Wednesday, Maha Nabami Puja on Thursday and Bijoya Dashami on Friday. 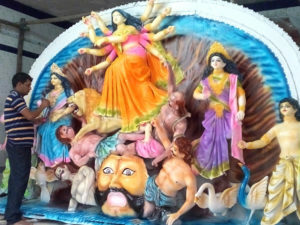 The five-day festival will come to an end with the immersion of the idols of the Goddess Durga on the day of Bijoya Dashami in the nearby rivers and water bodies across the country on October 19. Prime Minister Sheikh Hasina yesterday visited Dhakeshwari National Temple and extended her greetings to members of the Hindu community at home and abroad on the occasion of their largest religious festival Saradiya Durgoutsab. A mood of festivities is being witnessed among the devotees irrespective of ages marking the festival while adequate security measures have been taken in the puja pandals across the country. Draped in new dresses, a large numbers of devotees of all ages have already started thronging the city puja pandals, particularly at Dhakeshwari National Temple, and offering prayers before the Goddess Durga seeking peace, prosperity and welfare of the country and its people. Bangladesh Puja Udjapan Parishad General Secretary Nirmal Kumar Chattarjee said as many as 31,272 permanent and temporary mandaps were erected in the country, including 234 in the capital city this year. In Dhaka city, the largest number of crowd of devotees are being seen at Dhakeshwari National Temple, Ramkrishna Mission and Math, Kalabagan, Banani, Shakhari Bazar and Dhaka University Jagannath Hall puja mandaps. Security was beefed up in all Puja pandals throughout the country, including the capital, with the deployment of additional squads of Ansars, police, RAB and other law enforcers for peaceful celebration of the festival. Besides, voluntary groups are also performing duties at the puja pandals. All Puja committees installed close circuit cameras and metal detectors at their mandaps. Apart from offering prayers before the Goddess, Dhakeshwari National Temple has chalked out other programmes for the five-day festival including rendition of devotional songs, distribution of clothes among the poor, distribution of Mohaprosad, Arati competition, voluntary blood donation and bringing out a Bijoya Dashami procession in the city from the temple premises. Bangladesh Puja Udjapan Parishad and Mahanagar Sarbajanin Puja Committee this year decided that the immersion of idols of Durga Puja would be done by 10 pm on the day of Bijoya Dashami across the country. The organisations also urged organizers of Durga Puja across the country to keep the processions of Bijoya Dashami off from 12 noon to 2pm on the day coinciding with the Juma prayers.